Passion for Life Art organizes contemporary art group exhibitions uniting international artists coming from all over the world. It supports the program, Passion for Life, founded by Antoine Gaber, artist and researcher for drug development focusing mainly in cancer treatments. The two principals objectives of the Passion for Life campaign are to generate awareness about the disease and to raise funds to support research. In part, for this reason, Passion for Life events may include a gala dinner, conferences, and other awareness events to sustain this fight against cancer. 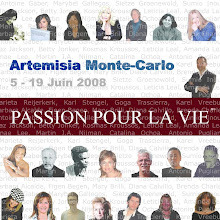 The next Passion for Life collective exhibition will be held from June 5-19, 2008 at the two Artemisia gallery locations in Monte Carlo and it will support GEMLUC with its fundraising activities.